If you’re ready to kick your classic date nights up a notch, Nebraska has many romantic spots that you and your partner are sure to love. Whether you’re looking for an intimate setting or something a bit more adventurous, here are 15 of the most romantic places in Nebraska to spend time with your special someone for any special day of the year. 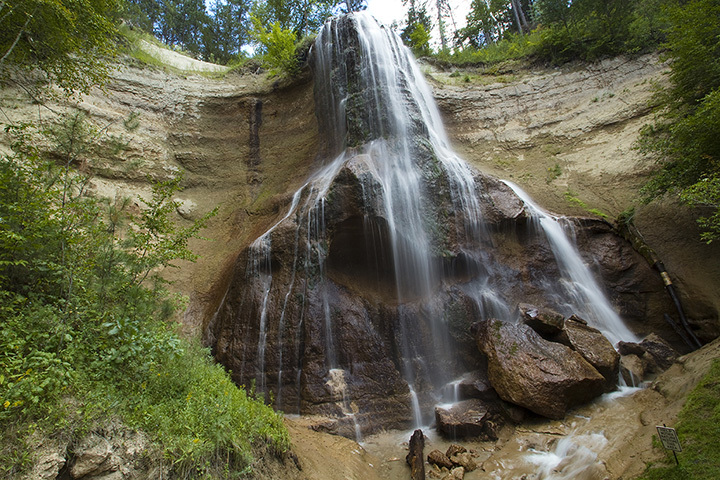 Smith Falls is Nebraska’s largest waterfall, at nearly 70 feet tall. Located in Smith Falls State Park, the breathtaking view has made it one of the most popular spots for first dates and proposals, even during the colder months! If you’re looking for a romantic weekend getaway with a twist, Slattery Vintage Estates in Nehawka offers a seriously glamorous camping, or “glamping,” experience. Each bungalow is furnished with lanterns, warm bedding, antiques, and uniquely positioned to overlook the surrounding vineyards. Wine, cheese, and other treats can also be purchased on site to complete the romantic outing. Go for a stroll and stop in the middle of the Bob Kerrey Pedestrian Bridge for a uniquely romantic kiss between two states. The 3,000-foot long walkway stretches across the Missouri River with stunning views of the Omaha skyline and serves as a connection between Nebraska and Iowa. For a Cinderella-esque experience, organize a special ride with the Chimney Rock Carriage Company. Formal, horse-drawn carriages will take you and your date on a truly memorable trip around the Minatare area. Take a step back in time at one of Nebraska’s two remaining drive-in theaters, The Sandhills Drive-In in Alliance. For movie lovers and cuddlers, nothing beats the nostalgic experience of the drive-in! Searching for a romantic date idea with a twist? Spend the day exploring the stunning Joslyn Art Museum with your special someone. Each room is filled with beautiful works from ancient times to the present. It’s truly a lovers’ paradise! With a glass of wine in one hand and a paintbrush in the other, enjoy a creative night out at Pinot’s Palette in Lincoln painting your own masterpieces. The intimate yet relaxed environment is a great way to break the ice (and show off your artistic talents). There is always something happening at the Lauritzen Gardens in Omaha for you and your special someone to enjoy in a beautiful setting. The botanical center features a 10,000 square-foot “tropical house” with vibrant flowers, waterfalls, a 5,300 square-foot “temperate house,” and a large indoor gallery for varying floral displays while strolling hand in hand. If you’re looking for the perfect date night restaurant in Lincoln, Vincenzo’s Ristorante is your place. You can’t go wrong with Vincenzo’s cozy atmosphere and outstanding, highly-rated Italian dishes. Located just a few miles outside of Omaha, this Queen Anne style bed and breakfast is the perfect romantic weekend escape from the city. Cuddle up with a good book, play a board game, or simply converse on the beautiful wrap-around porch and enjoy a delicious breakfast of homemade dishes. Treat yourself and your date with a relaxing visit to the James Arthur Vineyards, one of the largest vineyards in Nebraska. From barrel-aged reds to crisp whites, you’ll embark on an unforgettable tasting trip of some of the best wines the state has to offer. The Wicked Rabbit in Omaha is a favorite among the city’s romantics. The Alice in Wonderland-themed speakeasy is located inside the Looking Glass Cigars and Spirits shop and serves up some of the more unique craft cocktails you’ll find in the state. This enormous 260-acre getaway located in Nebraska City features quite the list of amenities that you and your special someone can enjoy. From the on-site bar and lounge to the world-class spa, The Lied Lodge is the perfect place to relax and rejuvenate together! Catch a world-class performance at The Orpheum Theater in Omaha, one of the most lavish, historic buildings in the state. Built in 1927, the theater features stunning ornate decor and an exceptional lineup of performances, ranging from opera to appearances by top orchestras.